With sadness we record the death on 23rd December 2018 of Tony Walker, who, amongst many other projects during a long and productive life, singlehandedly converted Sceptre into the lovely cruising yacht we see today. His obituary, written by his friend and colleague Mike Briers, can be seen here, and his own account of his work on Sceptre is published on this page. In 1973 I visited South Hants Engineering in Eastleigh to confirm the purchase of a SHE C32 hull and deck moulding for me to complete. The South Hants salesman took me out for lunch during which I stated my real love was for Metre Boats but they were all pre-war and too old to consider. He mentioned SCEPTRE lying at Berthons in Lymington, somewhat forgotten. I completed the SHE in 1974, got in some good sailing, won the 200 mile Barra Head race and put her up for sale. I visited Berthon and inspected SCEPTRE which was in one of Berthon’s sheds. The deck had been largely removed with just the foredeck left. All the gear was in an adjacent store together with a brand new Perkins 4.236 still on its transit frame. The owner E.A. King had commissioned Berthon to convert her to a cruising ketch – the mast cut off at the cap shrouds and a mizzen fitted . She was then destined for the Seychelles. However before any reconstruction could start the owner died so this was to be an Executors sale. SCEPTRE in her then present state was for sale for £12,500 but there had been no interest. At that time Metre Boats were not fashionable. In 1974 I offered £7,500 which was rejected; I repeated this offer from time to time. In 1975 my new offer of £9,500 was accepted. However my survey pointed out corrosion of the steel frames and that galvanic action between the steel frames and copper fastenings had softened some of the planking. On this report I obtained a reduction and finally bought SCEPTRE on July 15th 1975 for £7,600. A later acquaintance told me I had paid too much as it had been offered to him for £4,000! This represented only the value of the lead keel. At the same time SOVEREIGN K12 was for sale, nicely converted. A neat installation of the same model PERKINS 4.236 was placed under a saloon berth hydraulically driving folding propellers on each quarter with the rudder undisturbed. The sale price was £30,000. I offered £18,000 but she was sold for £22,000 to a French sailing school. I had ideas of running 12 metre charters in Scotland with both SCEPTRE and SOVEREIGN but could not find a partner for the business. I actually would have preferred to buy SOVEREIGN since she was already converted and had little or no steelwork inside. There was no way to get road transport to Berthon at Lymington to collect SCEPTRE. Work had already started (and stopped) on the installation of the stern tube. I arranged for Berthon to complete this and to fill the very few cracks in the planking to make SCEPTRE watertight. 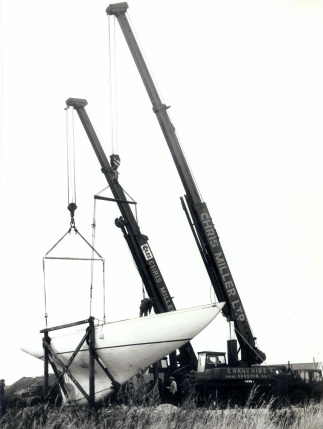 She was launched, towed to Hamble then lifted onto a specially constructed trailer for the journey north to Lytham. a) The mast length is 90’ 10”. The haulier said that anything moving on the road over 90’ needs Ministry of Transport permission – almost an Act of Parliament he said. But if I told him the mast measured 89’ 11” he would believe me. b) Motorway bridge clearance standard is 16’, sometimes a little less with resurfacing so height was critical but just enough. 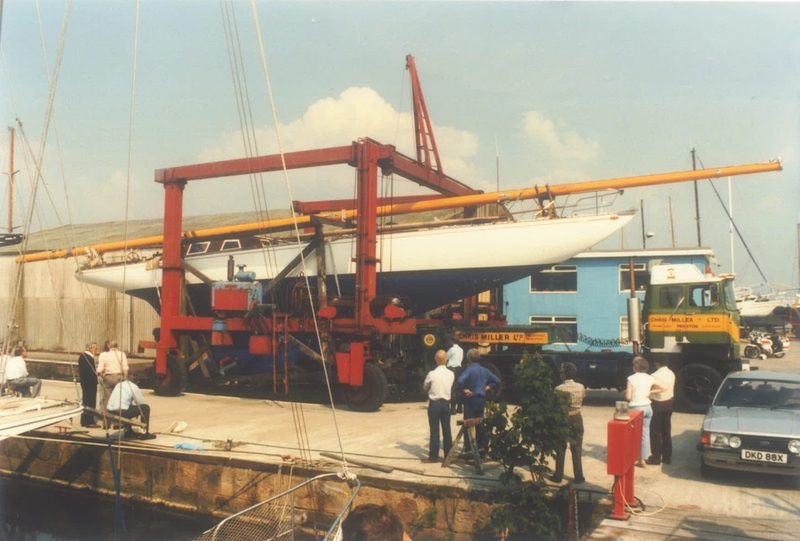 So SCEPTRE came to the Ribble Cruising Club dock on a specially constructed trailer with the keel only inches off the ground and with the mast on deck. Her substantial wooden cradle came separately and was reassembled. Two Chris Miller cranes lifted her into the cradle where she stayed for 9 years. I estimated 4000 hours to complete the project. This proved to be surprisingly accurate. I put in a total of 4167 hours. I logged 210 hours of help mainly from Arthur Wray for the engine installation and my son-in-law Malcolm with the final painting. I had hoped to do 20 hours per week to complete the project in 4 years but with working full time elsewhere I could not keep up the pace and completion took 8 years. My budget for the total job was a rather optimistic £14,000. This was considerably exceeded with the final spend coming to £26,990. SCEPTRE was constructed to an unusual design. For the 1958 America’s Cup Challenge David Boyd submitted two designs, one conventional and one unconventional. I suppose on the grounds we could not beat the Americans with a conventional design as demonstrated by the pre-war dominance of VIM, so the unconventional design was chosen after tank testing, the results of which were to be proved misleading. Hull speed is proportional to length and SCEPTRE tried to maximise length at both ends. Her shape tends towards what used to be called ‘cods head and mackerel tail’ in that the point of maximum beam is forward of amidships. Therefore as she heels the stern sinks so increasing the waterline aft, but also increasing a tendency to lee-helm. I suppose this is the reason Eric Maxwell (subsequent owner) decided to move the mast back from its designed position. To cheat the measured length SCEPTRE has an artificially snubbed bow. This feature had been a success for Olin Stephens in the 6 Metre BOB KAT but was unusual and he did not repeat it. 12 Metres at both ends of the scale, MAGIC at 62' long with more sail than VALIANT, 76' long and heavy - neither were successful. SCEPTRE at 70' lies towards the heavy end of the spectrum. Various semi-experts advised me to reduce the rig but I thought she was heavy enough to carry the original full rig. SCEPTRE’s hull was constructed using pre-war Honduras mahogany. I was impressed that the well-seasoned wood had not cracked too much after a few years in Berthon’s shed. Honduras mahogany (now virtually unobtainable) was standard for Metre boats and is excellent timber, strong, straight grained and not heavy. However it is prone to deterioration by galvanic action – in SCEPTRE’s case of the effect of copper fastenings in steel frames. My surveyor recommended sheathing the hull with nylon cloth and polyester resin up to the waterline to minimise the effect of sea water reaching the fastenings. The rudder had been cut by Berthon to accommodate the propeller and shaft. I thought this had weakened it and I reinforced it with stainless steel straps. The top sides were in good shape but 8 years outside at Lytham had led to several seams opening up and the splines loosened which needed regluing prior to final painting. SCEPTRE was designed as a rule bending half-decker. When I acquired her she had the original foredeck which was 1" Douglas Fir tongue and groove with black Jeffreys glued seams laid on ¼" ply. Berthon had already fitted the two laminated beams aft of the mast and there and elsewhere was ¼" ply but not always where I wanted it. The covering boards aft of the mast were loose in the boat and had to be refitted. I completed the deck to my required layout using Parana Pine – not the best wood for the job but I did not intend to keep a laid deck but covering it with Trakmark for ease of maintenance. This was subsequently replaced by the better product Treadmaster by the early SPS. For the coamings and deckhouse sides I used Iroko. This was in 1976, a very hot dry summer. Much of my work cracked in the heat needing fillets or fillers which should not have been necessary. In the 1970s silicone and polysulphides were only just becoming known and available. I bedded all fittings on Seelastic. For the deckhouse roof and bridge decks I wished to have a laid deck appearance and used various black fillers which were not always a success. Also in the 1970s stainless steel fastenings were not freely available and very expensive so in many cases I resorted to plated mild steel bolts and screws. Mr King was to have done by Berthon’s and this was the basis for my own plan. I did not want to have a deckhouse. SOVEREIGN kept a flush deck by siting the engine (same model as SCEPTRE) under a bunk near the mast. CONSTELLATION kept a flush deck by siting the engine on the centreline nearer the mast where the bilge is deeper and using the top of the engine hatch as the cabin table. However with the angle of the stern tube and length of shaft supplied I had no option but to make a deckhouse. The first job was to totally strip what was left of the original interior. Then clean and paint the steel frames. Then plan the interior. I acknowledged that SCEPTRE’S future must entail some chartering so I planned for 12 berths. I was concerned about the transverse load on the hull between the mast and chainplates. In an extreme situation a knockdown can generate a compression load of up to 20 tons on this size of boat so I fitted bulkheads, solid to port and only cut down enough to allow passage to starboard (the SPS didn’t like these and reduced them considerably). I thought the idea of the chart table over the galley would work well and in the heads compartment opposite I was able to reuse the original basin and BabyBlake unit. I was unhappy with the mast in its original form and spent an entire summer working on it. The mast track I considered inadequate and removed it. It was fastened by around 200 plated machine screws. I needed an impact screwdriver to remove them as they had rusted in. I fitted a track of more suitable size drilled, tapped and fitted with stainless steel screws. The original rod shrouds were rusty and scrapped. I was unhappy with the setup of only one set of spreaders giving shroud angles of around 7° and 10° which are too small. A norm for this sort of boat is 12°. I therefore moved the existing spreaders and created a second set to give the required angles. This meant introducing a third shroud each side with new chainplates. The original masthead halyard lock I did not trust so scrapped. 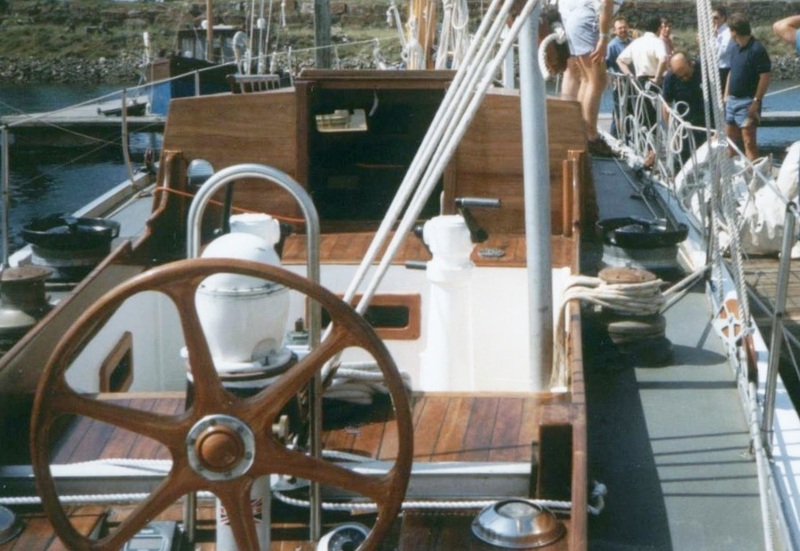 All the original halyards emerged from the mast at deck level with winches on the deck. I preferred winches on the mast. I fitted brackets for these and slots in the mast for the halyards. SCEPTRE was - I think – the first 12 Metre to have an alloy mast. It had been painted a golden scumble to make the opposition think it was wooden. I repainted it a golden yellow which even now makes SCEPTRE distinctive. Also distinctive is the mast’s plated construction. Extrusions were not available in 1958 but SOVEREIGN had one in 1962. The original boom was adequate. I fitted luff hooks and reefing blocks. Later we were given a spare boom from SOVEREIGN which was preferred to SCEPTRE’s original. The new standing rigging was obtained from Lee-Ward Rigging – not sure if they still exist. I like to work to Uffa Fox’s formula that the breaking strain of the shrouds on each side should be equal to the displacement of the vessel. In this case 3 shrouds each side, 12mm of 10 tons breaking strain = 30 tons. Spencers wanted to supply 15mm wire but I considered this excessive. The running rigging was all renewed. A new Perkins 4.236 diesel was supplied and came with the boat on its steel transit base. I was able to use this base cut down and modified as the boat’s engine bed. I made an aluminium instrument panel and fitted the exhaust system. Prop shaft and propeller came with the boat. The original steering was by a large wheel with wires to a quadrant. The wheel was not part of the sale and is, I believe, on the wall in the Royal Yacht Squadron. I obtained and fitted Whitlock rod steering to the existing quadrant cut down to suit. A new small wheel came with the boat and is, I think, still in use. I was able to refit the original mainsheet winch which is still in use. The genoa winches were were a gift to the Challenge by Leyland Motors ingeniously incorporating bus wheels, drive shafts, axels and gearbox with 2 speeds. I altered the drive shafts to suit the new layout. The 2 speeds proved cumbersome and subsequently only the low gear was retained. There were 10 other matching winches supplied by MS Gibb. In the 1960s and 1970s Gibbs was a major supplier of yacht hardware but is now gone. These 12CR winches were all ‘under the deck’ action. I visited the London Boat Show and spoke to Mr Gibb himself. He agreed to alter them to top action and supplied new handles. Over the years of the SPS these have all gradually been replaced. I bought a new winch and fitted over reinforced beams. The sails I acquired were those of the 1958 Challenge, plus some 1961 additions. 1958 was very early in the Terylene/Dacron era and sail makers were wary of making the new polyester too light since the stretch factors of the new fibres in sails were untested. SCEPTRE had 3 mainsails – 2 of 16oz cloth, 1 of 14oz cloth which are much heavier than would be used today. She also had 4 Spinnakers and 8 various sized headsails. The mainsails had to be fitted with reef points and new slides to suit the new track. I had one of the genoas cut down to make a small jib and a storm jib. The conversion and restoration project was completed in 1985. SCEPTRE could not be launched at the Ribble Cruising Club slip since it could not take her weight nor would there be enough water to do this. 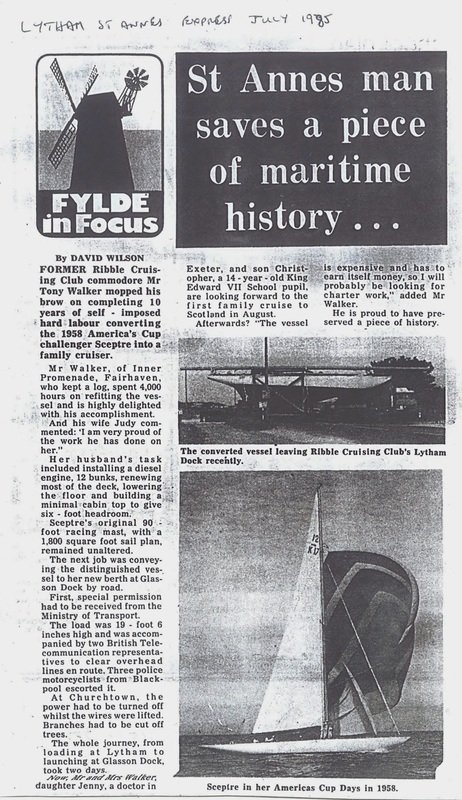 Therefore I commissioned Chris Millers to load and transport her to Glasson Dock, which was achieved relatively smoothly. Now with the extra height of the doghouse the total load height was 19’ 6”. Therefore there was no possibility of using the M6 so the load went on a devious route mainly up the A6 accompanied by 2 police motorcyclists, a Telecom van, and my son-in-law on deck fending off various wires. The Franklaw Treatment Plant lost its electrical supply temporarily. On the BBC radio a wag commentator advised transport to avoid the A6 as a large yacht was sailing up it causing major congestion. I still dream about this journey sometimes. SCEPTRE arrived at Glasson, unloaded on the travel lift, launched and the mast stepped. The water level in the basin had to be increased to do this and some local farmers complained. 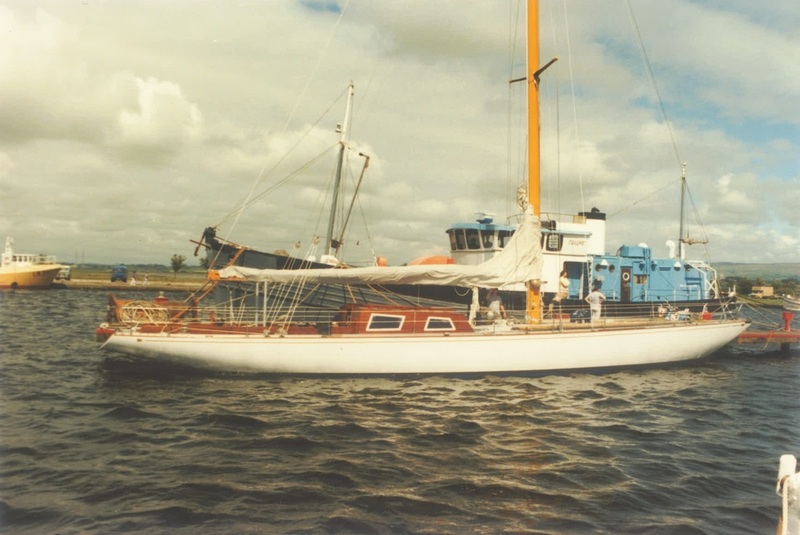 After a trial sail in September 1985, SCEPTRE wintered in Glasson. I realised she was too big for me on my own to sail or maintain so I put her up for sale. 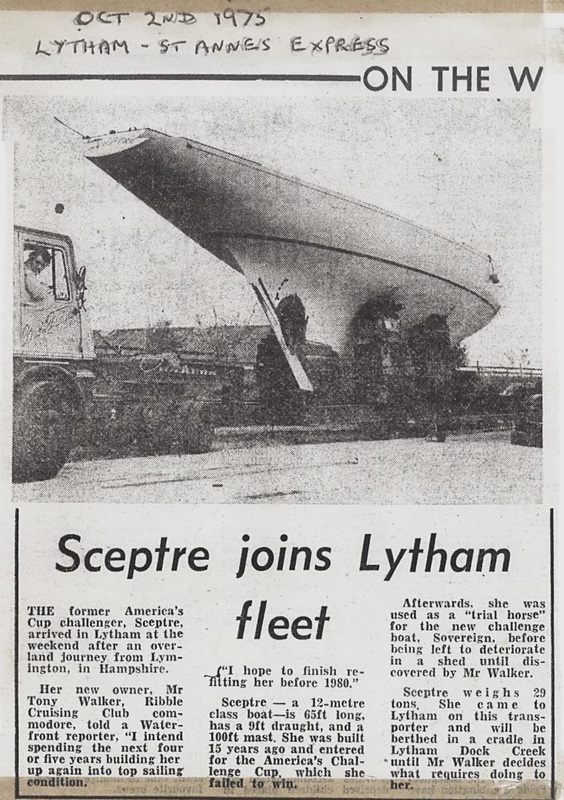 However, Stuart Carter, Eric Wright and John Roberts – members of Blackpool & Fleetwood Yacht Club and keen cyclists - went to Glasson, saw SCEPTRE and suggested to me that a syndicate should be formed to keep her in this area. They recruited other keen yachties and I sold shares to them and so the Sceptre Preservation Society was formed. In general syndicates generate friction among its members but not this one. We all knew each other; all had varying attributes to use on the boat and were responsible for their own piece of the action, either to do it themselves or to see it was done by another party. A constitution was drawn up and agreed but I believe this has since been lost. To make up to 12 shares in total Eric and John bought 2 each. I sold my share in 1989 in order to buy a new 30 square metre hull and deck for home completion. At the time of the formation of the Sceptre Preservation Society it was envisaged that it would last 5-7 years. The fact that it has lasted 27 years is a testament to the boat, its changing syndicate members, and the enormous pleasure SCEPTRE has given to so many people.